At Google I/O 2018, the tech giant explained its reasons for ditching the three navigation buttons on Android P. The company also spoke at length about Project Treble and why it's gaining steam only now. Intelligence, Simplicity, and Digital Wellbeing were the three big themes for all Android P announcements made at Google I/O 2018. Google, not only deepened its resolve to remove the three legacy navigation buttons owing to user frustration, the company’s Project Treble also gained steam as Nokia, Sony, OnePlus, Oppo, Xiaomi, Vivo and Essential were brought onto Android P Public Beta even before the Pixel 3 launch. On the sidelines of I/O 2018, we spoke to Dave Burke, VP Engineering (Android) at Google, to dive deeper into the company’s vision for Android P, a software update that changes the very way users interact with their Android smartphones. As was clear from Google I/O announcements this year, Artificial Intelligence will not only play the hero on Google’s devices, but will also within its software. According to Burke, the new operating system is an important first step towards the vision of AI on the core operating platform of Android phones. Intelligence on Android P comes from features such as on-device machine learning to anticipate users’ actions while maintaining user privacy. Features like Smart Replies - which predicts user replies within notifications and App Actions - which predicts the next action a user will take on an app, are both examples of how Google plans to put its AI chops to use on Android P, without private user data ever leaving the device. "The theme here is that the device is adapting to you"
“On the Pixel, we integrated predictive apps quite a while ago. It predicts the next app you are going to launch, and it gets it right 60 percent of the time. That was last year. This year, we wanted to go further and actually, suggest actions. Call your wife, navigate home, open documents, really the concept here is to have the operating system reach out to you. It just accelerates how you use the device. The theme here is that the device is adapting to you,” explained Burke. Another example of how Android P will add simple machine learning tasks to smartphones is Google’s new ‘Slices’ feature. The company is now providing new APIs for developers to define interactive snippets of their apps’ UI. In the context of Search, Android P users will see Slices of apps within the search interface, allowing for faster interaction with apps to complete desired tasks. This carries forward Android P’s simplicity theme which aims at fading technology to the back of the UI and making Android usage more natural and fluent. “Android started as a powerful OS, maybe too powerful. 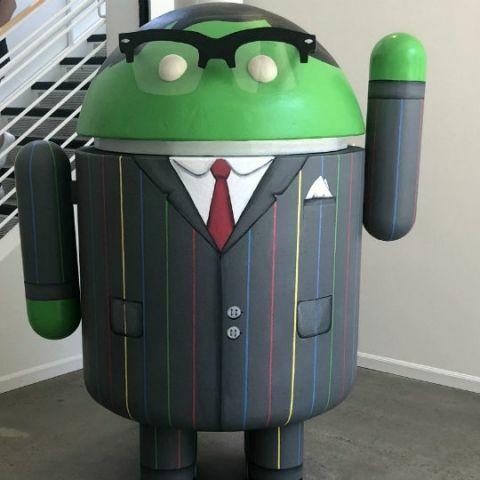 We’ve been trying to make Android simpler to use and more approachable so somebody who has never used Android before should be able to pickup a device and know how to use it,” said Burke. "We’ve had gestures since 10 years ago. It’s something we have been working on before them (Apple)." One of the big changes Google is making to Android this year is Quick Step, which is the name for the new gesture-based UI Android P brings with it. Quick Step combines all apps and overview. Burke tells us that while Google was careful to keep the soft Home button, it removed the other two navigation buttons to make way for more screen real estate and easier usage. According to the company, Android’s new swipe navigation is a much more powerful way to interact with phones and the decision was not made to ape Apple’s iPhone X navigation techniques. “From Android 1.0, we introduced gestures to bring up notifications. So we’ve had gestures since 10 years ago. Two years ago, we changed Google’s version of UI for all apps. So in the first Pixel, you had a gesture to swipe up and so we’ve been increasing gestures all the time. The bigger change is combining all apps and overview space into one. All the previous versions of Android have had three buttons, I always think of it like three doors. The problem with the overview was that you go down to this other place and then you have to back up to come to home. We wanted to change this relationship. It’s something we have been working on before them (Apple). It’s kind of amazing that they just moved to on-screen buttons. We found that lots of people didn’t really understand the three buttons and didn’t use multitasking. What we have learnt is that people who use the new UI multitask more,” Burke said explaining the thinking behind Android P’s new gesture navigation. "Project Treble will just work because we’ve got a formal interface and lots of tests done and contracts enforced." Aside from a simpler, more intuitive UI, Android P also brings with it a promise for faster updates which Google first introduced last year in the form of Project Treble support for all Android O devices. Project Treble was launched with the aim of reducing fragmentation within the Android framework by making it easier, faster, and less costly for manufacturers to roll out updates. While we did see a number of devices support Project Treble last year, this is the first time Google made an Android public beta available to smartphones from other OEMs. Not only did Google choose these 7 OEMs owing to their huge popularity and user base, Burke explained why we did not see results from Project Treble last year. So not only does Android P promise a faster, simpler and more intelligent operating system, it is also now that we will see more OEMs give users the benefit of faster Android updates thanks to a more streamlined and organised Project Treble. However, Google still feels that real benefits of Treble will only be realised by users 2-3 years from now. Head here to read more about all the new features coming to Android P.
How Artificial Vision Will Work?